How much do I need to pass my CFA® exams? Knowing how the CFA® Institute determine the passing score for the CFA® exams is a question that comes up every year, and no one seems to be able to give a satisfactory answer. Even the successful candidates never receive their actual marks, but are rather sent whether they scored less than 50% of the points, between 50% and 70% of the points, or more than 70% of the points by topic (e.g. Economics). This is represented in a table format with a star placed in the relevant column and row indicating what the candidate scored in each topic. Score above 70 % for the exam and you have pretty much guaranteed you have passed the exam. That is why all the mock exams, sample exams and question banks indicate that you have passed when you have managed to average over 70 % for whatever topics you have been testing yourself on. In reality the actual minimum passing score (MPS) is a closely kept secret each year and is determined through a complex process that involves the Angoff Standard Setting Method, psychometricians and a large group of CFA® charter holders who assess the entire examination, question by question, and makes an independent judgment on the expected performance of a just-competent candidate on each question on the examination. They do this twice taking into account both how difficulty the exam content was and how well candidates actually did. Is an item centered method, which uses the assembly of a group of subject matter experts (CFA® charter holders), who are asked to evaluate each item/question and estimate the proportion of minimally competent examinees that would answer the question correctly. The ratings are then averaged across experts for each question and then added together to get a minimum passing score (MPS). This MPS then represents the score which the panel estimates a minimally competent candidate should get. It is important to note that this is not the same as a bell curve where all the marks are altered to fit onto a bell curve distribution and everyone below a certain point fails. The Angoff Method purely determines how well someone who has the required knowledge to have passed the CFA® exam level would have scored and then relates the individual candidates to that benchmark. If a candidate did not manage to reach that minimum level of competence they should not be progressing to the next level of knowledge. How many topics can I have in the 50% -70% and the below 50% band and still pass? This is a pointless question as the bands give so little information of how a candidate actually scored in a topic that it is impossible to use as a effective gauge. Your goal should be to get as many sections as possible in the “above 70%” band. 1. A candidate who has scored in the 50% – 70% band could have managed to get 51% of the questions correct or 69%, which would have a dramatic effect on their overall score. 2. Topic weights play a major role in determining the candidates final score. A CFA® 1 candidate’s results in one of the larger topics like Financial Analysis and Reporting ( 20 % ) or Quantitative Methods ( 12 % ) have a much larger effect than the results from a smaller topic like Alternative Investments ( 3 % ). That is why it is so important to concentrate on the larger important sections in each level. You can pass if you get over 65 %! This theory is probably correct although you are not guaranteed success as you are seen to be on the cusp between competent and not competent. This is when your ethical knowledge could push you over into a passing score or drag you down into a failing category, with the The Ethics Adjustment. Read more about the The Ethics Adjustment here. 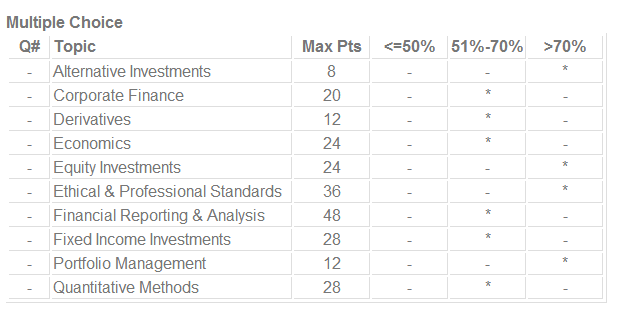 The CFA® Institute divides the unsuccessful candidates into ten groups based on their performance relative to the other unsuccessful candidates. The candidates in the highest scoring yet unsuccessful band were close to scoring the minimum passing score but fell only slightly short. It is important to note that anyone further away from the minimum passing score did not fail due to an ethics adjustment or a curve adjustment, but that they did not comprehend the work sufficiently, and need to put in more preparation to succeed at that CFA® level.